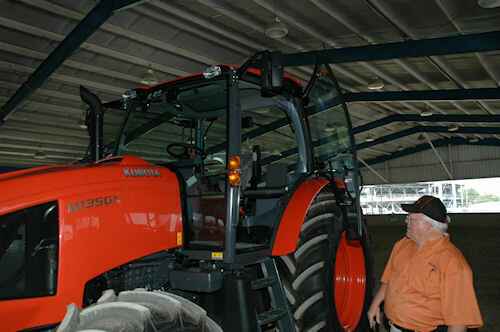 Dealers saw prototypes last October and Kubota put its new Grand X tractor and improved M Series tractors on the floor at the National Farm Machinery Show this spring, but a group of ag editors got a chance to examine the new machines a bit more closely during a Tennessee "ride and drive" this week. What we found was a company very interested in making its products more well-known through a new initiative to "market" its well-made tractors, and a company poised to start looking at higher horsepower machines as a way to grow the brand. Product Manager Paul Williams demonstrates the slide-out battery of heat exchangers for the Grand X and M Series tractor AC condenser, oil cooler, and hydraulic fluid coolers near the machines' radiator. Buck Trawick, Kubota's new director of marketing says Kubota has been an "engineering and manufacturing" firm, and is realizing it also needs to be a marketing firm. "Kubota is one of the best kept secrets in the industry," he quips, noting the Japanese manufacturer is making strides at promoting its products in a more aggressive way in the future. Also, he says the new Grand X line of tractors show where the company is headed as it tests the waters in higher horsepower classes in coming years. Rumors fly about large row-crop Kubotas by 2018, but Trawick and others aren't offering any specific dates. They're letting the new Grand X point the way for those who want to look at it. First, the Grand X's ergonomically designed cab -- in which you can sit in the driver's seat, stretch both arms out and barely touch the doors -- is obviously a design that can follow rising engine displacements in the future. All display, levers and controls, including audio and air-conditioning, have been designed strategically to be within easy operator reach on the right console or around the fully-adjustable tilt and telescoping steering column. External vertical hydraulic cylinders on the upgraded three-point hitch give the Grand X a stock lifting rating of 6,400 lbs. Optional cylinders will allow the hitch to lift 9,400 lbs. on the tractor's existing hydraulic system. Did we mention the new cab is QUIET? It is. And the visibility is much like a greenhouse, even for short editors! Tinted glass surrounds the operator and the four-post ROPS -- which hides the exhaust system on the right front -- provides nearly unlimited view from the drivers' seat. The newly-positioned hydraulic shuttle lever with finger indention is located just behind the steering wheel to allow quick access to forward and reverse without removing one's hands from the wheel. Likewise, the power train linked to the cab's handy controls features Intelli-Shift 24-speed power transmission with an 8-speed power shift in three ranges. A convenient single lever operates both the powershift and range shift, with upshifts and downshifts available with a joystick push button. The huge cab is the first thing you notice about the new Kubota Grand X mid-size farm tractor -- more than 65 inches wide -- and that cab points the way where Kubota is thinking its growth will come in the future. Product manager Paul Williams says the cab was an instant hit with dealers when they saw the machine last fall. The hydraulic system on the Grand X features two remote valves and 19.2 gallons per minute flow to feed external cylinders on the three-point hitch. Lift there is rated at 6,400 lbs., with optional configurations capable of well over 9,000 lbs. The pump for the system has been relocated to the right side of the vehicle frame, which cuts noise to the cab, and makes for more cab room behind the driver. Serviceability is good on the Grand X with an up-front battery leading the way for a series of slide-out coolers for oil, AC, and hydraulic heat exchangers, along with many sealed bearings throughout the machine and a handful of grease fittings on the hitch and front "king pins". Another good idea from Kubota that's been around several years, bi-speed front wheel drive, made its way into the Grand X, also. 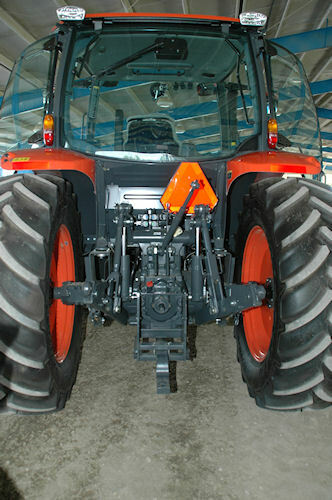 The feature monitors the steering angle of the front wheels while the tractor is pulling with all four, and once the angle reaches 35 degrees a planetary gear in the transmission kicks in to speed up the front wheel rotation 60% over its normal 3% lead on the back wheels. The effect is a front end that pulls you through corners, or helps you boost the hitch an inch or so during hookup while in reverse. Both the Grand X and the M Series Kubotas do 4WD tight turns with no backtalk through the steering wheel, and offer amazingly tight turning radius performance with wheels that angle up to 55 degrees. The power for all this engineering still comes from four cylinders -- 374 cubic inches total in the Grand X -- but the output is 135 net engine horsepower in the 2,200 rpm range and 118 hp. at the power -takeoff. The Grand X engine meets Tier VIA emissions standards with a common-rail electronic fuel injection system that makes multiple fuel pulses per stroke, an intercooled turbocharger, cooled exhaust gas recirculation and a diesel particulate filter built into the tractor's muffler. (Regeneration on the DPF can be done manually, or set for auto as the tractor is under load and working). The engine features 93 cubic inches and four valves per cylinder and fared quite well with its competitors in recent Nebraska Tractor Test trials, showing the potential for engineers to add one or two more cylinders to this basic block in the future as the need arises -- and we're assured it will. The long stroke, big bore torquer sports five massive main bearings and will surprise many with its ability to work on a minimum of diesel fuel. The Grand X makes no excuses in the fit-and-finish category and shows signs of lots of forethought in its execution, such as: lights on top of the cab, available at driver level on the cab, work lights on the upper nose, and headlights below the grill. A single 52-gallon fuel tank on the left cab frame, integral tool box, redesigned step assembly into the cab for easier entry and overall -- room to grow.